overyourhead: Talking of spoilers... We read Of Mice and Men at school. A great book, somewhat tempered by the fact that come chapter 3 or thereabouts, someone had scrawled in my copy, "I don't want to spoil all the fun but Lennie gets shot on page 113." 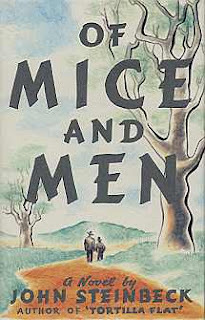 Talking of spoilers... We read Of Mice and Men at school. A great book, somewhat tempered by the fact that come chapter 3 or thereabouts, someone had scrawled in my copy, "I don't want to spoil all the fun but Lennie gets shot on page 113."